Can I guarantee that you won’t get sick from contact with black soldier flies? There is no species of animal on Earth that could live up to that guarantee, but researchers agree that black soldier flies (Hermetia illucens) are not disease carrying pests like common filth flies. I can understand people’s revulsion at the thought of flies in general. The common house fly is associated with 277 disease organisms. On the other hand, BSF have been the subject of many scientific studies and they are not known to be transmitters of disease-causing pathogens. I’ve read dozens of articles about using the larvae to process manure and about feeding them to animals and I’ve never come across any warnings about handling BSF. It’s easier to find information about humans transmitting pathogens than about BSF doing so. You can, however, find some nice photos of researchers holding big handfuls of BSF grubs and smiling broadly (the researchers that is). There are several aspects of the BSF life cycle that result in their non-pest status. The process of pupation results in all flies emerging relatively free of pathogens. It’s the lifestyle of the adult flies after that point that makes the difference. BSF adults (winged stage) only live for a few days as opposed to 30 or more days for house flies. Because of their short lifespan adult BSF don’t need to eat and in fact don’t even have working mouth parts. For that reason they rarely enter human habitats and they don’t compete with humans for food. House flies must eat so they cycle back and forth between waste material and our food. It’s that cycle that results in the transfer of pathogens and it’s the absence of that behavior that keeps BSF relatively clean. After emerging, the adult BSF mate and the female flies away in search of a suitable food source to lay her eggs near. The female’s preferred site for depositing her eggs is close to, butusually not on the food source. Eggs laid on the food source will have a higher chance of being inadvertently consumed by already feeding larvae. This is another characteristic that contributes to the BSF status as a non-pest species. In contrast to spreading disease there is evidence that the presence of BSF larvae can reduce pathogens in waste material. Bacteriological interactions associated with manure digestion by maggots are favorable. Maggots are competitors with bacteria for nutrients and often reduce bacterial numbers greatly, or eliminated them altogether (Beard and Sands, 1973; Sherman, 2000). Maggots may consume and digest microorganisms, and produce antibacterial and/or fungicidal compounds (Landi, 1960; Hoffmann and Hetru, 1992; Levashina et al., 1995 and Landon et al., 1997). As maggots reduce pathogens in manure they may make it safer for organic vegetable production. Flies that have been used experimentally to process manure include house flies (Musca domestica), face flies (Musca autumnalis), blow flies (usually Sarcophaga sp.) and the black soldier fly (Hermetia illucens). Except for the black soldier fly (Furman et al. 1959), all of these are considered pests as adults due to their disease vector potential, behavior and preferred habitats. When a food source has an established colony of BSF larvae other species of flies are rare or even absent. The larvae produce an info-chemical that alerts other flies to the fact that the source of food is already being dominated by BSF larvae. I’m not suggesting that black soldier flies or their larvae are perfectly sterile. You and I are not perfectly sterile. Pathogens are everywhere and it is common sense to wash your hands after working with BSF, just as you would after petting a dog or shopping at the grocery store. Very interesting article here! I haven’t yet read the source material so will still need to look them up, but have to say the larvae look more like woodlice in your picture! Hi Mosey, thanks for visiting! The BSF larvae do resemble woodlice in a photo, only the BSF are MUCH prettier. I found BSFL in my compost last year and looked them up online and the info I found on them made me happy. They are impressive little critters. So far this year they haven’t made an appearance in my compost. I think it’s because I haven’t been stopping by the coffee shop and getting grounds like I did last year. It seems they really like that stuff. Glad to see your blog. I think these critters are awesome. I’ve noticed the same thing about BSF and coffee grounds. Could they be caffeine junkies? One theory I have is that the grounds help them digest food more efficiently because of the caffeine, the texture, or both. I’m glad you found my blog and I hope you’ll let us know if any BSF larvae show up in your compost. BSF larva are also known as ‘Phoenix Worms’ and are excellent feed for insectivores such as Reptiles, Birds, Tropical Fish, and Sugar Gliders. They are High in calcium (about 50x +/- more then other feeder insects) and lower in fat. They also make extraordinary composter insects that can consume large quantities of food including meat and dairy before it even rots. I’m in Maryland. Had to go to metal trash can composters, as there is a rat problem here. Noticed maggots in the compost this summer. But how do I know whether they are the disease carrying houseflies or black soldier flies? Thanks. House fly maggots are smaller than that of black soldier flies. A BSF larvae can reach almost an inch in length. You can also observe the area where the maggots are located to see what type of fly is present. If you see more than 3 or 4 house flies around the pile then the larvae are probably not BSF. If you see no, or few houseflies around the pile I would suspect you have a BSF colony because BSF larvae give off an info-chemical that repels other species of flies. If you really want to be certain about the species the best way is to put a few maggots in a jar and see what develops. If you provide them with food, water, and air you will soon have an adult fly to identify. House flies develop much quicker than BSF so if you have them you’ll know within a few days. Me and my daughter found tons of these bad boys when stirring the compost today, we immediately recognized them as larvae, thought fly species likely, and found our way to here from searching “big larvae in compost” then searching the genus and species viola! Not many flies found in compost have such large larvae- a handy characteristic for identification. They actually look much less dingy when you bathe one in water. less brown, more yellow. We especially like their pointy heads (my son, daughter, and I) This blog is excellent, we’re going to slap the one we bathed under the dissecting scope to get a closer look. I can email my drawings if they’re any good and you are interested. I am a lab instructor for an ecology class at the University of Oregon. Me and my children study insects for fun. Thanks for a great blog, good info can be hard to find. Jarrett, thanks for the kind words, I’m glad you had a good experience with the BSF larvae. I was laughing at myself today because I was cleaning up on of the three larvae I’ve been photographing daily. You can see that thread here. One of them had a piece of food that didn’t wash off and I had a tissue rolled up and I was gently wiping it clean. I would love to see the results of your examination. Like many pet owners I have a pet poop problem my BSFs LUUUUUV poop and have taken over the bin I used to deposit them in. The resulting compost I have dropped on the landscaping trees and not much else because I’m conserned about the possibility of zoonotic parasites. Has anyone studied this as a transmission vector? Hi Pego, sorry it took me so long to respond! I don’t believe there is reason to worry about using the compost for growing vegetables. I’ll check back when I have some sources to share. I am very interested. I am ina pet service industry and find myself giving the Toxocariasis lecture to people who hqave the perfectly normal idea of walking barefoot in the grass that has had pet traffic. I would so love to see some research and show it to some of my clients and friends. oHHh… i thought they are pest. i found many of them on my backyard just suddenly and i wonder where do they came from? Black soldier flies are native to the southeastern U.S. but they have spread around the world, mostly in the tropics and subtropics. They thrive anywhere that the climate is warm and humid. They can be cultured almost anywhere, but they would not survive in the wild unless the conditions were favorable. and i can’t seem to figure it out where did they came from. it just sudden that they appeared on nights. do they actually live on trees? juwANna, the black soldier flies have most likely been present on your property for years but they went unnoticed. The adult flies only live for a few days and aren’t attracted to people. I live where the BSF originated and they are very common, but most people here could not recognize an adult BSF. Many people here have seen the larva though, because they live longer and stay in one place, assuming the food supply is consistent. The adult flies are attracted to bushes after emerging and there they mate. After that the males are rarely seen and females seek out rotting food so they can lay their eggs by a good food source. After mating and laying eggs the short life of the BSF adult is over. Most of the people in my area know about BSF larvae because they are excellent for fishing bait. Once people use them they tend to seek out the larvae for this reason. I’m from Davao, Philippines. I’m happy to tell you that after searching the net for BSF infos, I finally made myself a bin where we throw our kitchen wastes including pig manure and chicken dung from our nearby farm. The results are great! Not only do we reduce our garbage (only non-biodegradable materials were thrown as garbage) but we also have lots of larvae to feed our chickens and flowerhorns. The rest / part of the wastes goes to my methane digester where we use it as fuel for cooking. I am currently planning to put the BSFL poop to my nearby vermi project.. Your blog is of great help. Thanks! That’s great Bong, I’m glad you enjoyed the blog! Hi I posted a link to your blog this week because I have discovered BSF larvae in the compost pile I happily started when I moved to Hong Kong just a few months ago. I was immeasurably relieved to find out these guys are actually good and maybe even great for my compost pile. Now if only I can convince my kids & neighbors… Thanks loads for your great info. Hi Jerry, I hope I can use your blog to send a message to a countrymate regarding BSF. Really desperate to find some for our Farm, thanks! Hi Bong (from Davao, Philippines), this is Regina. I am based in Quezon City. Can I buy a few pieces of your BSF larvae? I would like to cultivate BSF for our farm to get rid of the houseflies. Please email jemerc(at)gmail.com if you are ok to sell. Thanks. No problem Regina. I edited your email address so that spambots couldn’t grab it. Hi, we have a worm factory that we keep in our basement and I found that we have many of these BSF’s now, Is there a way to get rid of them? How could I get them out and stay out, they are flying all around my basement. My kids love to take the worm farm into school for show and tell, I can’t have these guys flying all around the school. I see they like coffee, I’ll stop giving the worms coffee. If the worm farm stays indoors you shouldn’t have much trouble excluding any additional BSF grubs. For them to occur in your worms you either have to introduce BSF eggs or allow access to females that have mated. It’s not likely you brought eggs inside unless someone collected food scraps that have been outdoors. Mating isn’t likely indoors either, especially since you’re probably getting rid of the adults quickly. These bugs are beneficial and harmless so if you can manage to collect them and release them outdoors you’ll be doing a good deed. If you need clarification about anything please let me know. Hi Jerry, Bong, Regina, I am based in Pasig, Philippines. Just bumped this blog today in search of cheap food for my free range chicken in Zambales. Great Blog indeed! Saw a few larvae last month in my coffee ground – carabao dung mix for my ANC wormbed and I thought they were pests so I discarded them. Had I known earlier, would have collected them. Anyways, will be wiser next time. Just two questions for now: #1. How can one increase the colony of worms when mature BSF only mate outdoors? #2. Can I make an enclosure, say made of net, and simulate their natural environment with the purpose of a continuous system? Thanks very much Jerry for starting this blog. 1. If you keep your food source in an area that the wild BSF can access they will come to it continually and lay eggs. The main limiting factor is temperature, but I don’t think that’s an issue where you are. The best scenario is to have the BSF unit outdoors but under some type of cover that keeps rain out and fully shades it all day to avoid overheating. You can increase the size of the colony by increasing the surface area of the unit and the amount of food/waste deposited. 2. Yes, you can enclose the colony in a net, but I don’t see the benefit of it. Adult BSF females are strongly attracted to an actively feeding colony of BSF grubs so keeping them contained in an enclosure isn’t necessary for a continuous system. We have been experiencing a drought here in Houston, Tx. after several years of heavy to moderate rain during the summer months. What I find interesting is they were crawling into the building and all over the back porch and this was after a rainfall. It’s hard to convince the women in the building these little critters are very good for us and our small environment here when they can’t stand the heron which nest at this time of the year and as we know birds poop about every 15 to 20 minutes and this isn’t the most pleasant of smells. Do you think the heron will eat the larva? Everything has an enemy. It sounds like you had several larvae in the building which is a bit odd. I’m guessing that there was some relatively old garbage near some type of opening in the building. I’m pretty sure BSF larvae don’t target indoor environments, I would guess that they more or less pick a direction and keep going until they find a suitable pupation site. If there was a colony close to the building that would explain the presence of several larvae. If the colony is/was far from the building I highly doubt you would have seen more than one or two larvae inside. The reason I say the garbage must have been old is because BSF take much longer to develop than houseflies. The eggs take over 4 days to hatch and then it takes at least a few weeks more before the larvae reach their full size. If what you saw were the dark colored mature grubs then those eggs would probably have been laid a month or more in the past. If you want to stop the larvae from wandering into the building I would look for the forgotten garbage that they’ve inhabited. I expect the herons would eat the larvae with gusto. BSF larvae are eaten by a wide variety of animals including fish, birds, reptiles, and amphibians. despite my girlfiend not liking the fact that we have hundreds of squirming larvae on our balcony I’ve kept the compost, grubs and all. It really is amazing how quickly they get through the veg waste I put in. In order to stop proliferation I tried sealing off the compost using black plastic bin liners. This doesn’t seem to have had the slightest effect on their population. I have a drip tray under the compost which fills up every so often with the large mature grubs. I’ve tried starving them and they seem to be (almost) indestructable. I have now given up on being nasty to them and have decided just to let them be and let them help me make great compost. Thanks for the advice on obtaining grub free compost, Jerry. If, when I need to use my compost, it’s still grub infested, I’ll use your technique. Thanks again for the blog and the info. These critters really are quite something. BSF love to lay their eggs in the folds of plastic can liners so you’ve really just done them a favor. Whatever you cover the compost with the BSF will simply lay eggs on the outside of it and the tiny hatchlings (1mm X a thread’s thickness) snif out your garbage and crawl inside. BSF want one thing, decomposing food. If you ever decided to discourage them simply limit your composting to grasses, leaves and other high cellulose items which BSF can’t digest. Trying to starve the mature grubs is kind of funny because they don’t eat in that stage, they don’t even have a mouth. 😀 All they want to do is to pupate and emerge as adults for a few days to mate and lay eggs. Please let us know how the story develops. I’m not an expert, but don’t believe there is a problem with using BSF to process human (mammalian) waste and then feeding the resulting grubs to fowl, even if the chickens and eggs are in turn consumed by humans. Of course you should get a more informed opinion before doing it. The idea you present is almost exactly what Dr. Paul Olivier, the inventor of the BioPod, has tried to accomplish in Brazil and also in Vietnam. Unfortunately I think he has encountered several difficulties because many people in developing countries want to emulate the US and other modern people. Maybe this “primitive” but elegant technology needs to be embraced in the West before it can be accepted elsewhere. You might enjoy this presentation that was put together by Dr. Olivier and others: http://www.esrint.com/pages/bioconversion.html. You’ll see a reference to a urine diverting toilet at the bottom. I would like to see the actual work done as far as analysis of larvae and nutritional components. I’ve seen what I think is a lot of inaccurate info regarding this in the past. I have read such things as 40 % protein and the occasional 50%? Also fat levels seem to be all over the place and certainly feeding just Soldier fly larvae to insect feeding animals is not a good thing with fat levels so high.If you either have the info someplace else that I can see or can refer me to a place where accurate analysis has been done I would much appreciate it. Most of the data that I’ve seen referenced is based on studies by Dr. Craig Sheppard and Dr. G. Larry Newton, who have both studied BSF extensively. Dried black soldier fly (Hermetia illucens) prepupae contain 42% protein and 35% fat (Newton et al. 1977). Live prepupae are 44% dm and are easily dried for long term storage. As a component of a complete diet they have been found to support good growth of chicks (Hale 1973), swine (Newton 1977), rainbow trout (St-Hilaire et al. 2007)) and catfish (Newton et al. 2004). Peer reviewed studies show that prepupae meal can replace at least 25% of the fish meal in a diet with no reduction in gain or feed conversion ratio (FCR) in rainbow trout (St-Hilaire et al. 2007) or channel catfish (Newton et al. 2004). Separation of the prepupae fat and protein would allow for formulation of more balanced diets and produce a meal with over 60% protein. Removal of the chitin would further enhance the protein content and enhance digestibility as well as produce another valuable product. Blind taste tests with tilapia and channel catfish fed diets containing Hermetia larvae indicated no significant difference between those diets and commercial diets (Bondari & Sheppard. 1981). Omega-3 fatty acids were enhanced in Hermetia prepupae that were fed fish offal mixed with manure (St-Hilaire et al. 2007). Omega-3 fatty acids increased from negligible levels to approximately 3%. This finding raises the possibility of enhancing other nutritional factors in Hermetia prepupae by custom feeding of the growing larvae. Of course the concentration of fats and protein will be significantly less in fresh larvae. I haven’t seen any studies that recommend a diet consisting of BSF exclusively and I wouldn’t think it’s a good practice to feed any animal such a restricted diet long term. I’m sorry I couldn’t provide more information. Perhaps you would share the conflicting reports that you’ve found so that I could follow up on this. Hi GW, I am visiting the different sights and learning all the while. Last night in the dark with my light on (my set up is on the porch) I saw a different fly that looked like a cross between a wasp, bsf, and a yellowjacket. All he was doing besides ignoring me, was checking all the small vent holes out….almost looked like it was eating maybe larvae from around the holes? Any answers? Bill, it certainly could have been eating larvae or maybe BSF eggs. Most BSF eggs get laid in clusters in protected crannies but I also see some being randomly scattered around the walls of my BioPod. The holes in your unit could very well have individual eggs around them. quick question. How do you eventually separate the dirt from the soldier fly larvae? I have a good population of larvae and would like to use the dirt they are making. If you separate a portion of the compost from the main pile the BSF will soon cycle out of it assuming you don’t add more food scraps to it. The BSF grubs are there for one reason, food. 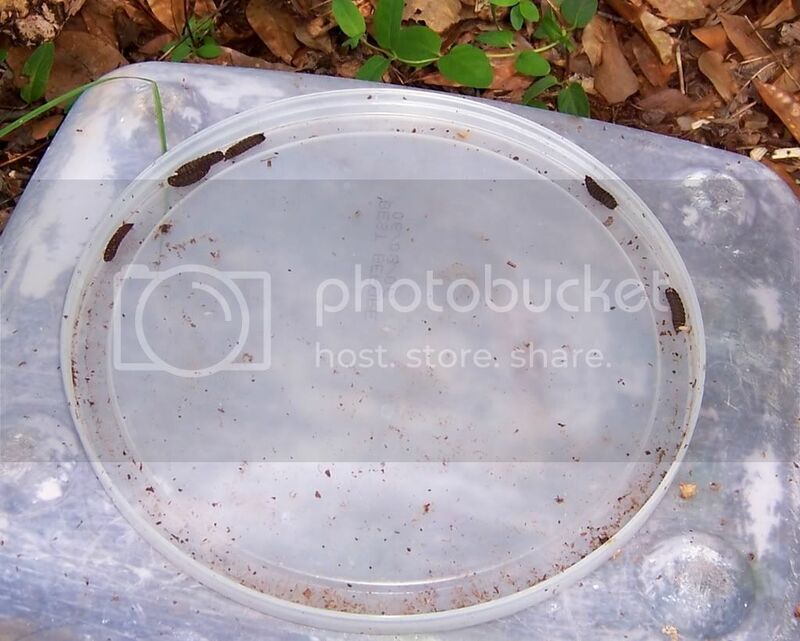 If the compost is in an open container the grubs will simply leave after any remaining food is consumed. If you want to have more control in removing the grubs from the compost you can use food scraps as bait and capture them using the method I describe here. Hi Bong (from Davao, Philippines). Can I also buy some of your BSF larvae. I would like to start them here in Iloilo City, but I can’t find them. I removed your email address from your comment because I believe it can result in your getting spam. Unfortunately it’s not possible for me to ship animals out of the country, but luckily it should be very easy to find them in your area where the climate is ideal for BSF. Look for larvae where people keep livestock like pigs and chickens; the larvae will be in the manure. Also they will be found in worm bins and traditional compost piles where people are processing food scraps. If you find BSF larvae in a medium like manure or compost try to bring some of that medium home with you. The combination of larvae and medium will be a powerful attractant to female BSF looking for egg laying sites. I’m sorry I do not know anyone working with BSF in the Philippines. As I said to Jojo; it should be easy to find them in your area. Good luck! I have a lot of BSF larvae in my composting bin. They’re working very hard everyday eating any organic thing i put on the bin. I just knew from your blog that this larvae have a lot of benefit. No wonder the small lizard like to walk around the bin. Our compost bin is in the backyard behind our house and it is abundant with larva/grubs? & they do a great job. However, we find some small ones dead on our basement floor during the period when they are active. Recently, I found 3 adult flies buzzing around my tv room. Not pleasant. You indicate they don’t go in to the house however I guess they do on occasion. How best to keep them outside and not in our house where they might find a source for laying eggs? In Atlanta, GA.
I’ll bet the BSF larvae in your basement aren’t dead but are pupating instead. That would explain the adults in your TV room. Don’t get me wrong; BSF do sometimes go into houses but it’s unintentional because they don’t eat and only target rotting food and manure for egg laying sites. If a BSF does find itself in a house it will immediately try to escape. The kind thing to do is to gently catch it in a cup and release it outdoors. If you’re concerned about them laying eggs in your house you can relax; they only want to get outside to find a mate. Even if an egg laden female found her way into your house she would only lay eggs on rotting food, not fresh. I think that BSF larvae are migrating away from your compost bin and finding a way into your house where they’re pupating and emerging as adults. I recommend finding and plugging the gaps that the larvae are using to enter your basement. First, the larvae must be developing somewhere on an adequate food source which is usually rotting food. If you have a compost pile or worm bin near the house that might be the source. Because they need a good quantity of food over a period of weeks before they can fully grow it’s not at all likely they’re maturing inside your house. Once matured the larvae crawl away from the food source in search of a safe dry place to pupate. They head out in a random direction (I assume) and some of them will end up crawling towards your house. Of course at that point they would need to find a crack to enter the house. One other possibility exists since you’re finding them in the bathroom. BSF will breed in human waste and they might be finding a way to enter your septic system. In theory if the larvae are developing in your septic tank or waste pipes they could be crawling through the pipes and entering the bathroom via the toilet, sink or bathtub drains. They would have no problem passing through flooded sections of pipe. You see, it’s possible they could enter the septic/drain system through a small opening because when they first hatch they’re very tiny. Once they grow to their full size they might not have any other exit than through the pipes and into your bathroom. The BSF females are good at locating waste and if they’re finding even a small opening in the septic system they can lay their eggs on the outside of it and the newly hatched larvae will crawl inside and develop. If you’re finding them in the tub or sink I would think this is the situation. All you need to do to stop the intrusion is to find and seal whatever openings are allowing the larvae to enter the house directly or through the waste pipes. Do you have a place on your blog that lists the supplies needed to build the composter? I’ve seen pictures and illustrations, but I haven’t located the list of needed materials yet. I thought it would be best to start with all the needed supplies before I try to build one. I’m building a v2.1 unit as I type. I’m taking more detailed photos than before and I’ll post a parts list very soon. I have adult black soldier flies in my finished basement. Is this a problem? Do they eat wood timbers or wood foundations? What is their food source and how would I identify it? Even if they are not a problem, I would like to get rid of them – how can I do this? I keep my bin so close and, since I am not feeding fish with them ATT they just wander off from their food source, sometimes into my house, to pupate. Notably when it’s rainy At that time, even tho the larve still have mouths, they are no longer eating any more. Okay, tell me how BSF’s end up in my toilet. I have an enclosed septic system… only recently these ‘flies’ have become a problem. and only recently have we started serious composting. The compost bin is 150 ft from the house. there are no apparent leaks in the system. We are not bothered by an abundance of flies in the air. Help me to understand so I can eliminate an embarrassment when company comes. thank you. Maybe it’s best if we start at the point where BSF females lay their eggs. Your septic system has drains and vents and the BSF must be coming from one of those sources. The vents might be a good candidate because they supply an easy entry point. If you want to investigate that possibility I recommend placing strips of corrugated cardboard or plastic around the vent outlet. The voids in the corrugated material are attractive egg laying sites for BSF, and it is easy to see when eggs have been deposited. In the past I’ve answered this question only based on the idea that the larvae must be from eggs laid near a hole in the tank or drain pipes, but I think the vents represent a higher probability. These BSF got into our commercial composting toilet and we had the hardest time figuring out what the heck they were. This article was very helpful. So — they DO get into houses. But it wasn’t a big deal. They are probably actually quite helpful in processing the material. Just disconcerting when something comes buzzing up against you when you are doing your business… We do cold composting inside with our toilet (we are off the grid so can’t have a “heater” in the toilet. and have hot composting outside in a compost pile where we mix other stuff in. Their larvae are present there in abundance but I didn’t know what they were before. I’m glad to know. What I and others promote is the idea that BSF adults don’t normally enter houses, but most houses don’t contain manure. I assume that the composting manure in your toilet does not have a strong odor, but rest assured, BSF females are experts at locating manure and rotting food, even if the scent isn’t noticeable to humans. Your attitude about the BSF is refreshing and I hope you can find a way to deal with them that makes everyone comfortable. Thanks for sharing. Yep — We have to have a pipe vent that goes out onto the roof. It is not electric, but is driven by the updraft of the air coming off the material in the toilet. The only thing electric are two small DC fans which do keep the smell away from us and also help dry the material somewhat so that it composts in a mostly aerobic environment. I’m sure that the flies came through the roof vent, where the smell is sure to attract them. We could probably put a screen or something in the vent, but I’m not sure we want to do anything to prevent them. They are much more pleasant than many other insects that could get in there and they are very helpful. We have a hinged screen in the bathroom window, so it’s easy to let them out and they are, indeed, beautiful as you say. It’s nice that you and your family is able to appreciate the BSF. I’m curious about the effect of the larvae on the compost. If you live in Ohio as your email address indicates, I would expect that the adult BSF are finished for this year, but the larvae may survive through the winter in your compost. It would be great if you can provide occasional updates on your observations. She uses a glass terrarium with a netting enclosure above to allow the flies to mate in flight. Hi! I’m a vermicomposting addict, but I must say this is very intriguing to me. I’m from Manila and I can’t seem to find suppliers for BSF. Great anecdote. Makes me want to find BSFs in my compost bins too! I have found two black soldier larva in our commode lately. How can this happen and what should I do about it. Can they climb from septic tank through pipes to commode. I know this is what it is because I looked it up, and it was identical to all pictures. I have read that they are beneficial to septic tank but I don’t like them in commode. I imagine BSF larvae could navigate sewer pipes but the question is how are they entering the system in the first place. BSF larvae are tiny when they first hatch so a pinhole is enough to let them in.. Since BSF females lay eggs near waste including excrement maybe they’re laying on a vent pipe on the roof after being attracted to the scent. BSF were traditionally found in outhouses throughout the south and were considered beneficial. I can understand why you wouldn’t want them in your commode, but if you’ve only had two make the journey I expect it would be a rare event. I would just flush them and keep an eye on the situation. I can’t think of a remedy assuming that your septic system is functioning properly. Please let us know if you keep having the same problem. The sewage pipe actually has enough air to allow larve or rodents to move about. That they are coming up in your toilet DOES mean you have some pipe breach that is open to air, might be improper venting, which won’t be too expensive but may vent noxious gases into the house, or there is some damage somewhere. Thank you, We had septic repairs last summer and the top was off the tank for a day or so could they enter then and just now be showing up? I do have someone coming to check pipes under house. I guess I could have them check vent on roof also. Will they harm the septic system and what happens when they cant get out to complete their change to black soldier fly? Do they die eventually in my tank. I was surprised you answered so soon. I appreciate it and thanks to your blog now I’m not scared of them. Thanks for the feedback Pego, the more the merrier! Janice, the top being off the septic tank may be the answer. I’ve personally had larvae take 6 months to develop due to cool temperatures so 9 or 10 could be possible. Being underground would keep the temperature cool even in warmer months. Concerning the roof vent; even if the BSF were attracted to the vent I don’t know what you could do the prevent that. I’m less enthusiastic about the vent theory since virtually every house has them and this is a rare occurrence.I wouldn’t bother with that unless maybe you have an ongoing issue. The larvae will not harm your septic system in any way and if they can’t escape they’ll simply die and decompose with the other waste. MI PREGUNTA ES : SE PUEDE ALIMENTAR A LAS LARVAS DE BSF CON UNA MEZCLA DE CAMA DE POLLO Y EFLUENTES DEL DIGESTOR DE BIOGAS? ENTENDIENDO QUE SALE CON BACTERIAS ANAEROBICAS ,?, O HAY QUE AIREARLAS PRIMERO ? O SE COMEN LAS B. ANAEROBICAS ? desde ya muy agradecido por su respuesta . They did a BSF composting toilet prototype! Where do BSF’S come from. They just showed up from nowhere. What’s there purpose?